Aalayam - Colors, Cuisines and Cultures Inspired! 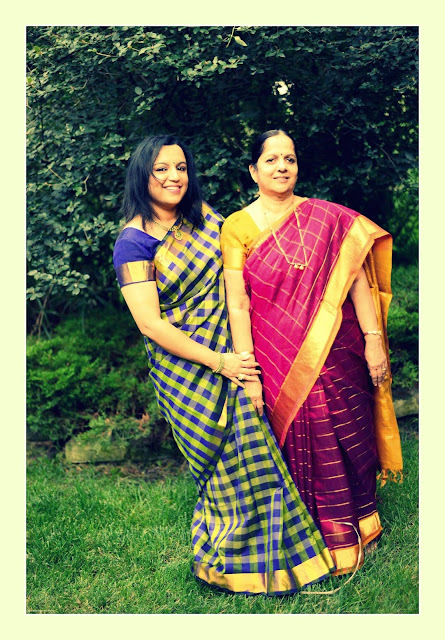 : Saree Soirees - The long and the short of it! 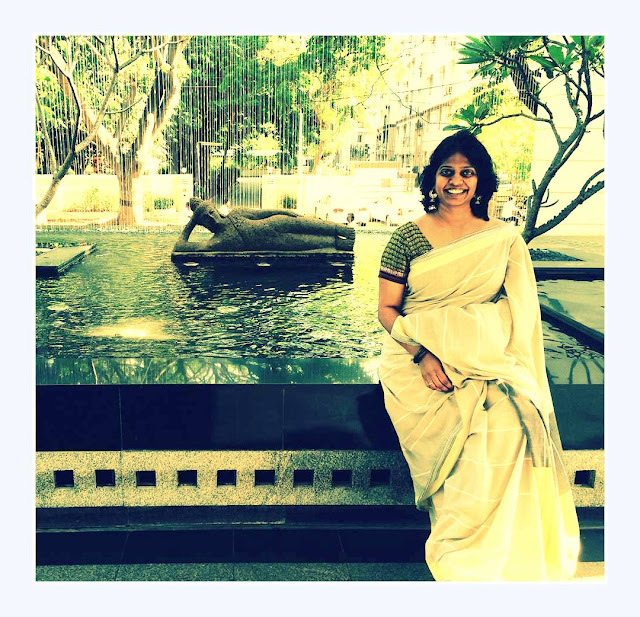 Saree Soirees - The long and the short of it! I am back! And this time with a story that is close to my heart! We are galvanized by the #100sareepact concept that is trending currently, and we are serendipitously looking forward to revisiting the well loved Saree, and to embrace it - the Aalayam way. Supriya in a black (her favorite color for a saree) Varnangall! 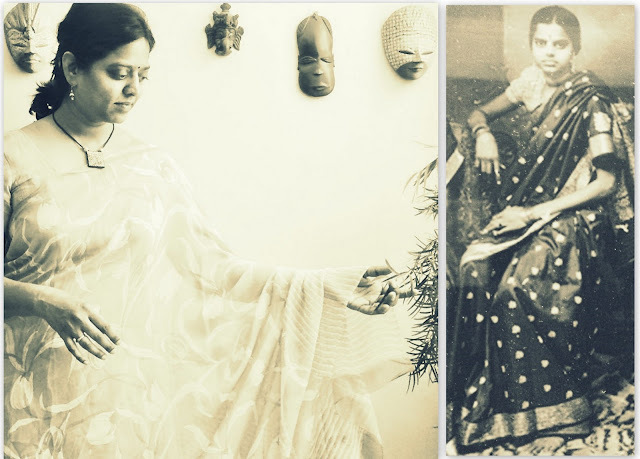 In this post, we are showcasing some stalwart women close to our heart, and the impact the good old saree has made on our lives over the generations....and as part of the Indian cultural milieu. 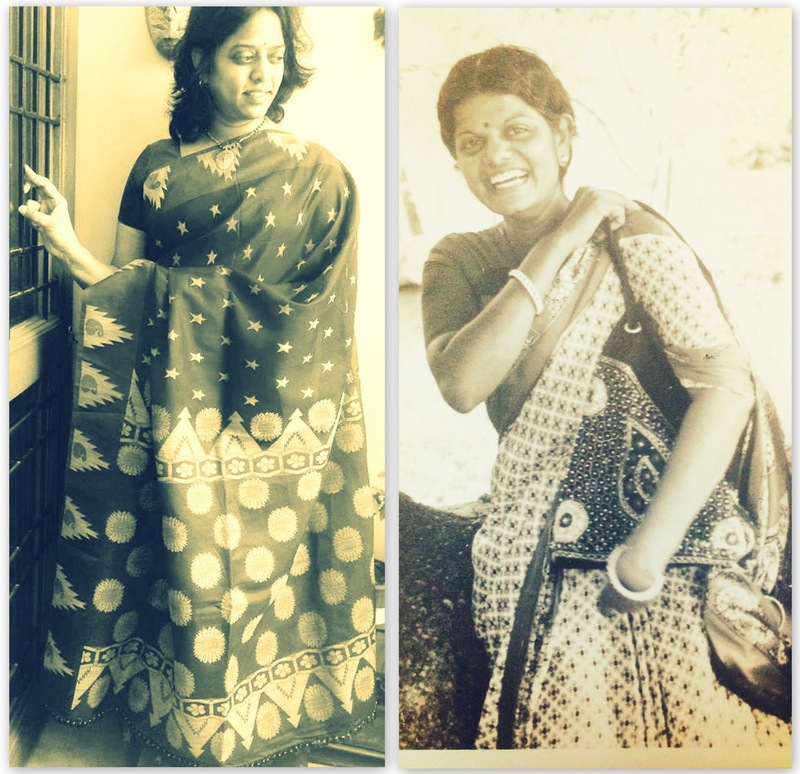 Supriya's mom and her aunt (chikamma) adorning gorgeous Kanjeevarams! Her inspiration for dressing up. It is only natural that we weave the story around our moms/mom figures/grand moms, and their generational saree treasures and memories. Supriya's parents' wedding cermony. Notice Supriya's mom wearing a gorgeous checked temple saree, that has made its reappearance in many a cousin's wedding! We want to revisit those poignant memories, and bring home the epistle on how today's generation embraces culture and its attire and their take on it. So be blown away by the ballads surrounding the favored saree treasures, and the memories abound with touch, smell, color and cultural flavor! 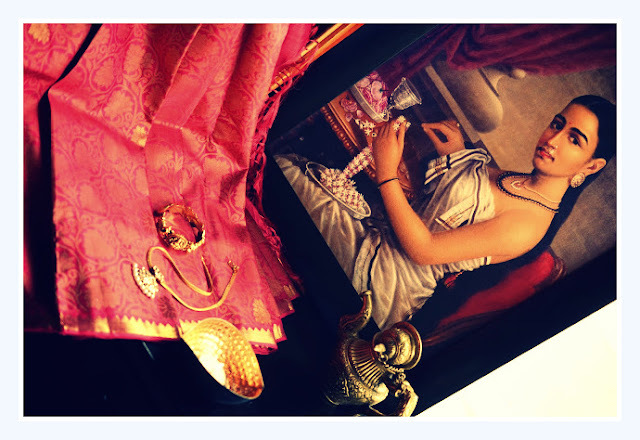 A modern take on the saree, and on the accessories that speak with it! Compare and contrast the sarees for everyday attire and sarees for special occasions, and marvel at how the form and function have changed over the years! 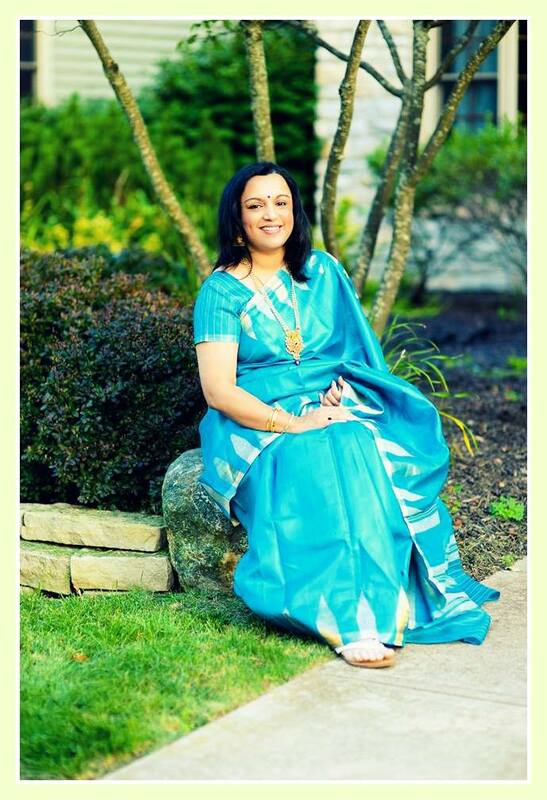 Supriya's mom - her epitome of saree perfection! Get ready for a modern retelling of Sarees Stories! Here's Deepa's take, and her saree inspirations! In the past, I’ve talked about fashion as an expression of our individualism. I have also commented on fashion as an extension of our interest in culture and creativity and by that logic fashion is ultimately about who we are. I am a saree lover and have always been one. Deepa, in her gorgeous splendor! My closet is full of exquisite silks and their worthy companions! These are bonafide souvenirs of landmark events - weddings, housewarming, anniversaries and such! My sarees bear a trove of sentiments! A South Indian girl's tout ensemble - a stamp of my cultural identity! I am also a fashion purist and a big believer of time tested classic styles. I do not fancy transient trends. 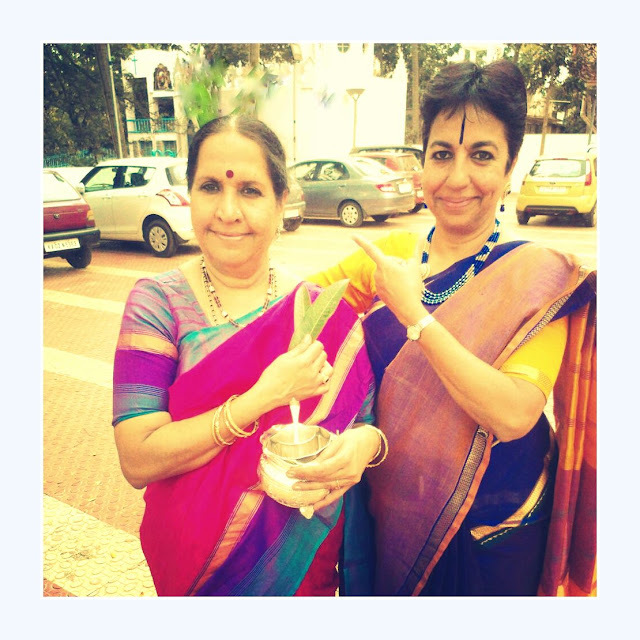 Deepa and her mom!, both in spectacular kanjeevarams! I am on a personal mission to collect sarees from all over India simply for the love of fine weaves, varied textures, striking hues and intricate motifs. Perhaps, my fondness for sarees is genetic. My mom, grand mom and aunts are all saree divas and wear their sarees with passion and panache. So, this is an inherited passion and my dear family lovingly enables my indulgence! My mom is my fun(nest) dress up partner. Color, pattern and accessory coordination- she is always in and I love her spirit! I started wearing sarees early. At 18, as a first year government medical college student I was mandated to. The saree was considered as the only attire worthy of the professionalism that it took to serve patients. Back then, I groaned at the prospect of waking up 30 minutes early to allow enough time for draping – I was a novice with no skills, you see and it was such a comfort to hide behind the lab coat! As with everything else, the love and the skill evolved and took a life of its own. Now, living in the United States, I lament on the lack of opportunities to dress in my Indian finery and so the saree is mostly relegated to parties and festivities. But that hasn’t diminished my love or my drive and participating in the 100sareepact is yet another way to relive my saree love. 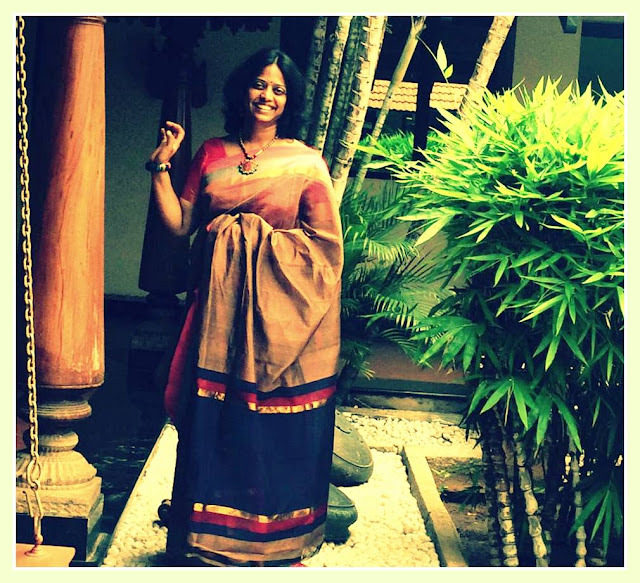 I have talked about the saree as the greatest ode to India’s textile heritage on Aalayam previously (click here) and I thank Supriya for bringing a few of us together to share our collective admiration for the Great Indian Saree with all of you. Deepa and her favorite dress up partner! We also roped in our favorite diva (you've met her before here!) who has embraced the #100sareepact with so much energy and enthusiasm, it was only natural that we went spell bound by her infectious enthusiasm and shared her story! 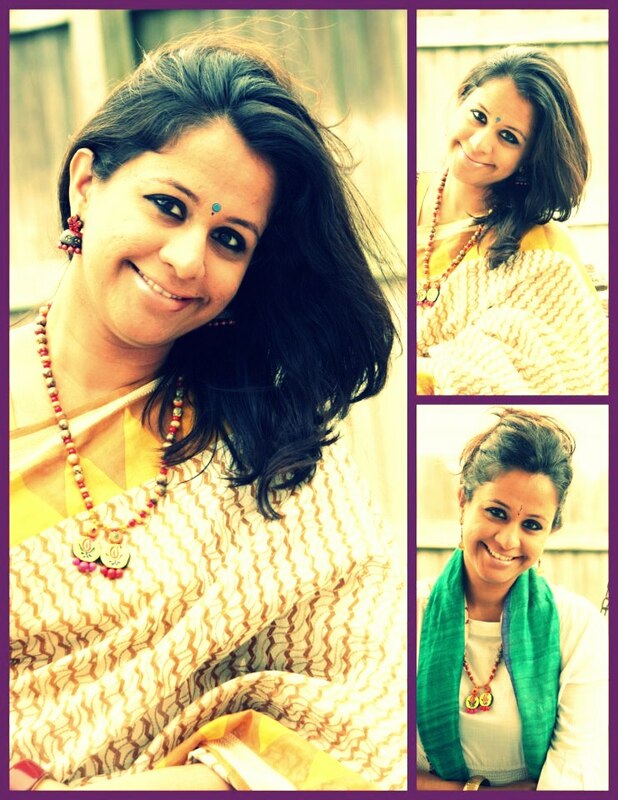 Here's presenting Arthi Anand , and her saree inspirations. It must be genetic as my mom loves them and her grand daughters do, too. 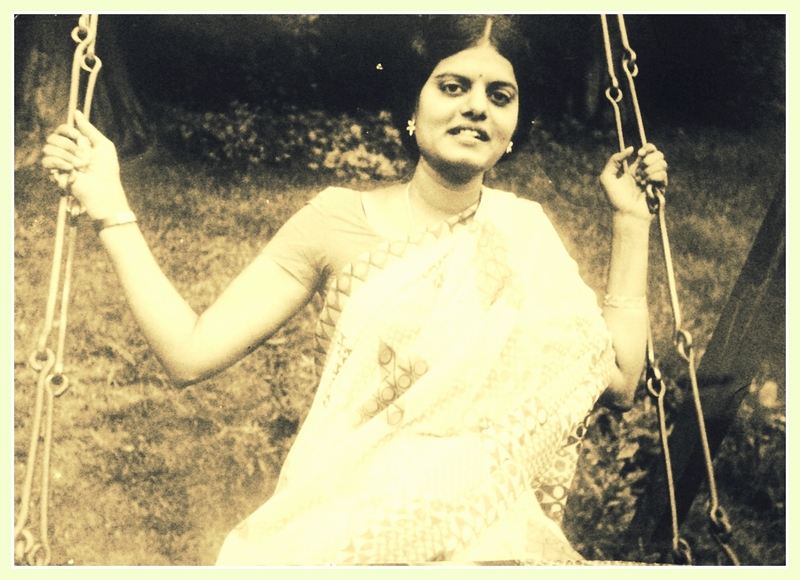 As a kid I loved to see my mom in a sari, which was daily. She would don crisp cottons from all over the country and I learnt some bit of geography there. I would help ma press her pleats just so. A fun take on a crisp cotton! In winter and on occasions the silks would come into display and here I learnt some economics. In the monsoon the synthetics would be worn a bit reluctantly but their sheer beauty was not lost on me. My earliest recollection of me in a sari is when I was about 7 yrs old. If I was home alone, I would pick out her soft Garden yellow- white sari and try it on and attempt to fold and put it back. Amma never asked me what I had been up to. Abound in pleasant paisley memories! I could not wait to wear them once I was a teen and would wonder why my mother resisted and tried to get me into ghahras and paavdais. Now I know she wanted to cherish her child a bit more and not let her turn all woman, too soon. 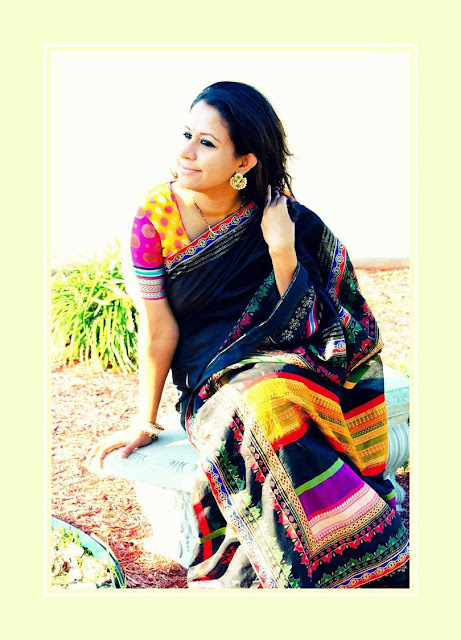 Once I turned adult, I continued to wear saris to work ( not daily like my mom) but at least monthly once. But a few years ago, once I began work form home, it dwindled. Except during Navaratri and other festivals. 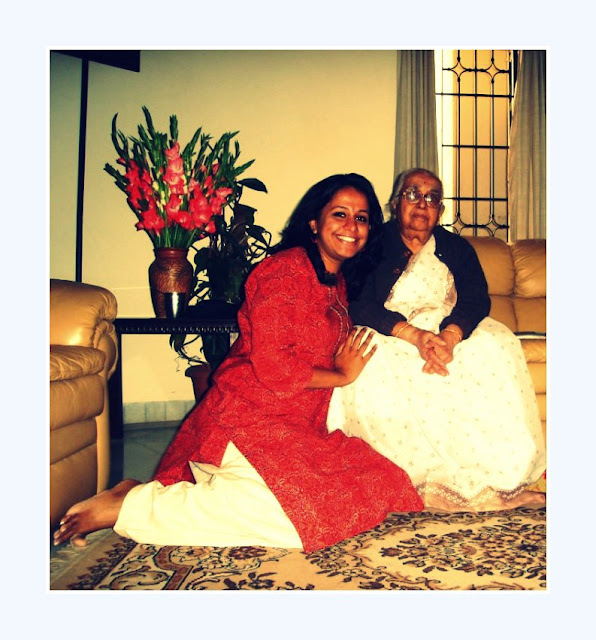 Arthi traverses down the memory lane! Arthi, at her workplace! Rocking the elegance of a saree in the modern day world. 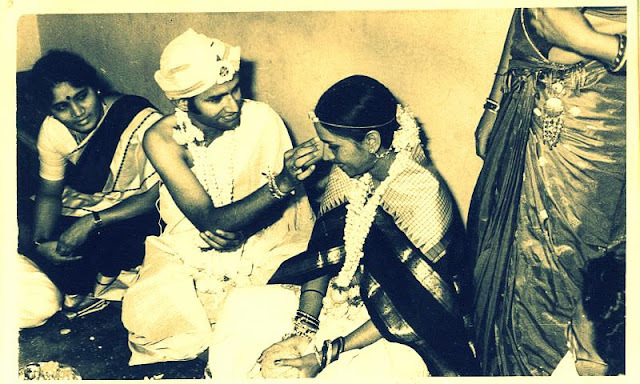 The Vishnu Sahasranamam sessions in the apartment got my mom to wear a sari weekly once at least. 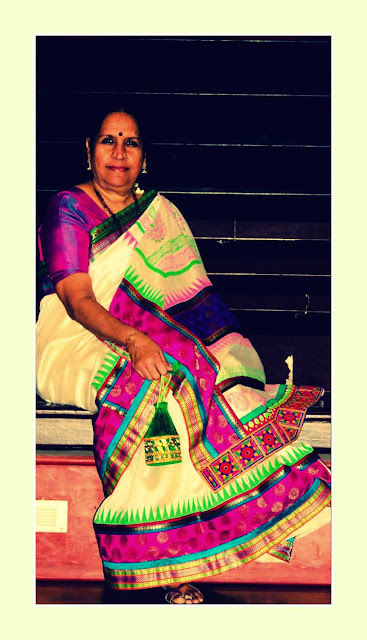 And for me, the 100sareepact came as a catalyst to get me to consider sarees on a more regular basis. My friend Monika coaxed me as she knew my love for sarees. The sari is forgiving- whatever your body shape or size ( the blouse is another story now) When worn well, the regal elegance the six yards imparts the wearer cannot be matched by any other attire. 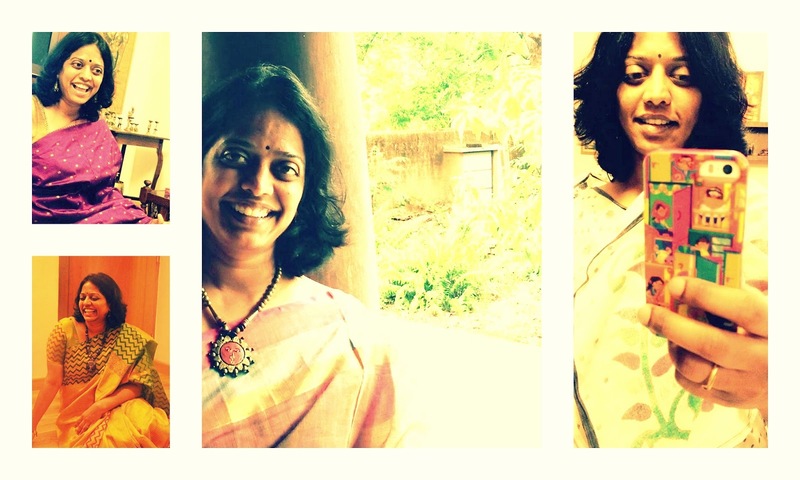 Arthi, in her various moods - all in the many many kinds of sarees she lovingly brings to life everyday!! 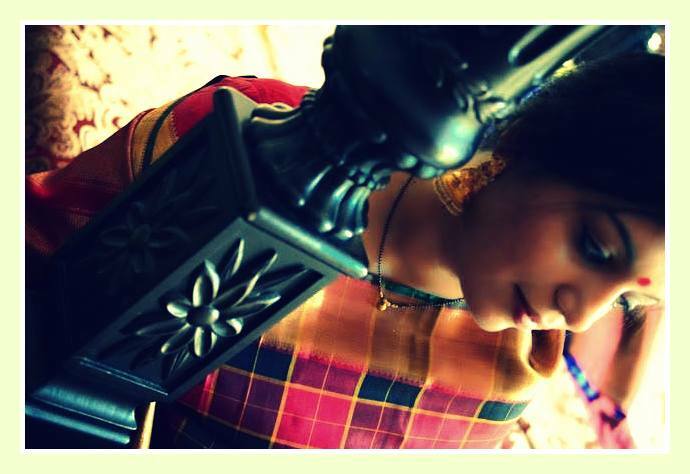 Check out Arthis Facebook page for more of her Saree stories! That was quite an exotic traverse down a richly textured memory lane was it not? As you know, our adopted home is in the United States, and we are always looking for opportunities to showcase Aalayam and increase its' relevance in the modern day readers' sensibilities - here and across the world. So,this feature was our humble way to drive home the cultural awesomeness that we are part of - as Indians! Hope you enjoyed it. Thank you Sruthi!! Always a pleasure to hear from you! Thanks for sharing nice pictures and article.